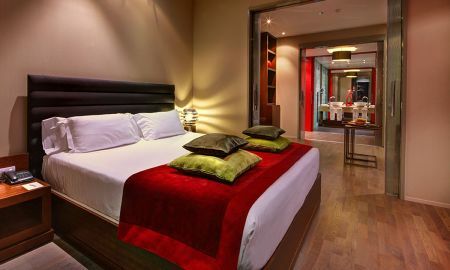 Minimum Stay 4 Nights Offer! Early Booking Offer - 7 Nights in Advance!! Early Booking Offer - 60 Nights in Advance!! Combining design, comfort and personalized service, Olivia Plaza hotel is a modern building offering an avant-garde decoration and the best services for business and leisure travellers. 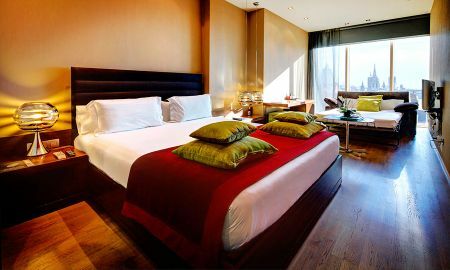 The hotel's 113 rooms are extraordinarily comfortable and decorated to provide spacious, bright and pleasant surroundings. The ‘Nineteen' restaurant is an utterly unique place in the heart of Barcelona, where you can unwind and relax, have a drink, enjoy a tapa or Mediterranean specialities prepared with prime products, in a cosy and warm atmosphere. The Olivia Plaza Hotel offers 3 convention halls with capacity and flexibility to organize, in the heart of Barcelona, your meetings, conventions, presentations and special events. The terrace bar is a space of silence and unexpected surprises where you can spend marvellous summer nights and enjoy a cockatil watching the Absis of the Romanesque church of Santa Ana. 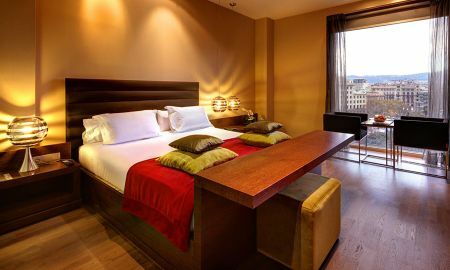 Olivia Plaza hotel is ideally located on Plaça Catalunya, right next to the Ramblas, the best museums such as Picasso and Macba, the shopping area, Passeig de Gràcia and El Portal del Àngel.